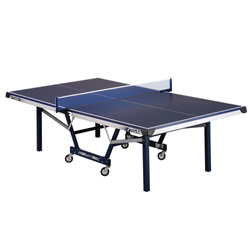 SGA1101: The Synergy Table Tennis Table features a patented Quickplay chassis design for convenience and durability from Stiga: Play the Best! 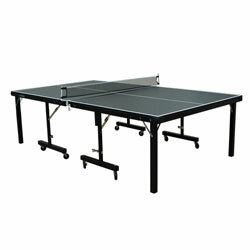 Features: -Synergy tennis table. -Patented quickplay chassis design. -Widespan technology. -0.63 Black playing surface for improved control and stability. -2 Steel apron. -1.75 Steel self-opening legs. -3 Mag ball-bearing wheel casters with locks. -Molded corner protection pads. -Wooden bottom board cross-brace support. The Stiga Table Tennis Racket Cover will shield your gear from unnecessary wear and tear. Its durable vinyl cover increases the life of your equipment by keeping it safe and protected. It is stylishly designed with an orange and black front featuring the Stiga logo. This table tennis racket case comes in an over-sized design that provides for easy opening and closing. It also enables you to store more than one item together without damage. 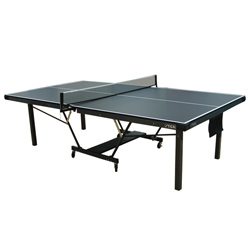 This rubber inverted Viper Table Tennis Racquet has a 5-ply, 2.0mm sponge blade and a concave handle. It is bound to give you an edge over the competition. 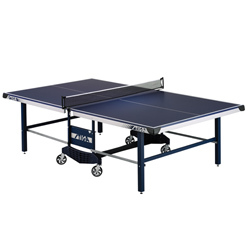 The Stiga Table Tennis Table, STS 285 is a true workhorse that's designed for fun or tournament level play. This table is built to last. 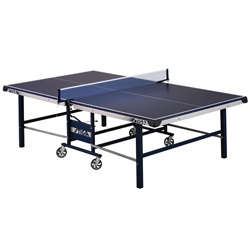 The Stiga Tennis Table has a sturdy top that is sanded and UV filled prior to multiple coats of specially formulated paint. Then it's finished with a top clear coat to give you reliable durability. Whether you play inside or outdoor table tennis, keep the balls in the easy to use storage containers. 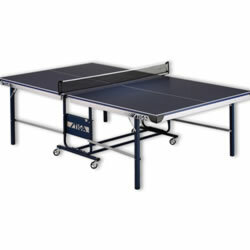 The Stiga Table Tennis Table, STS 285, makes for an ideal game. Comprised of genuine Saran green netting, this Table Tennis Sta-Tite Net is designed to continually bounce back to its original shape, even after thousands of balls have hit it. With regulation striping. Fits most tennis tables. Why have a pool table and table tennis table when you can have all in one? 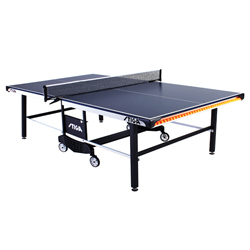 Converting your pool table into a table tennis table is easy with the Stiga Table Tennis Converter Top, and make your game room complete. Fitting most 7- and 8-foot tables, this converter top features a half-inch thick dark green top with center-mounted steel stiffeners to keep it sturdy, side strips to align it properly, and sponge rubber strips to keep it in place while also protecting your pool table's rails.